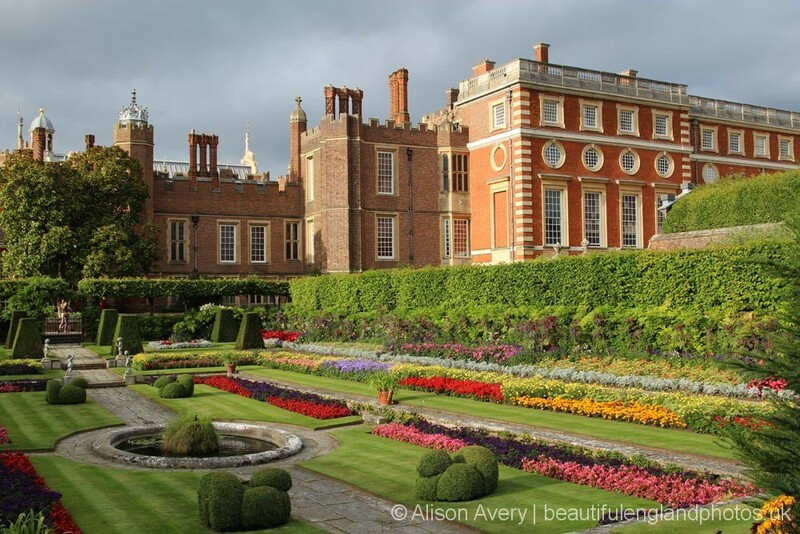 Hampton Court Palace has been attracting visitors from all over the world since 1838, after Queen Victoria opened the Palace to all her subjects and is one of England’s most popular tourist attractions. A visitor to the magnificent buildings and 60 acres of gardens, can experience over 500 years of English history. 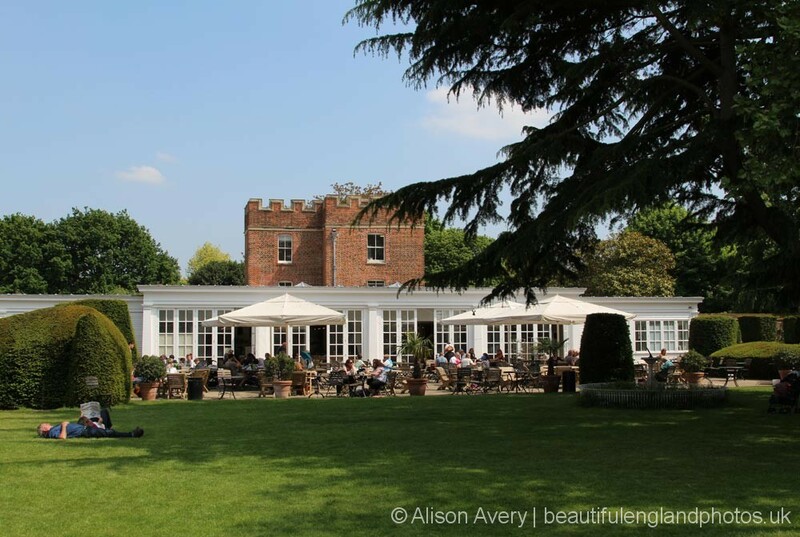 Situated on the banks of the River Thames and only twelve miles from London, it is easily accessible by train from Waterloo Station. When touring the Palace and Gardens, it is difficult to contemplate all that has happened here since the 16th century, when it was occupied by the Kings and Queens of England. The names of persons associated with Hampton Court Palace read as the contents of a “Who’s Who” of English history. Cardinal Wolsey, King Henry VIII, Queen Anne Boleyn, Queen Elizabeth I, King James I, William Shakespeare, King Charles I, Oliver Cromwell, King William III, Sir Christopher Wren and Queen Victoria, have all played their part in creating the beautiful and fascinating scenes that we see today. The initial view of the rose red brick Main Entrance from the west, is memorable for the visitor. This is the Great Tudor Palace of which only half survives. The remainder of Hampton Court Palace was rebuilt by William III as a stunning baroque palace and was first occupied in 1700. 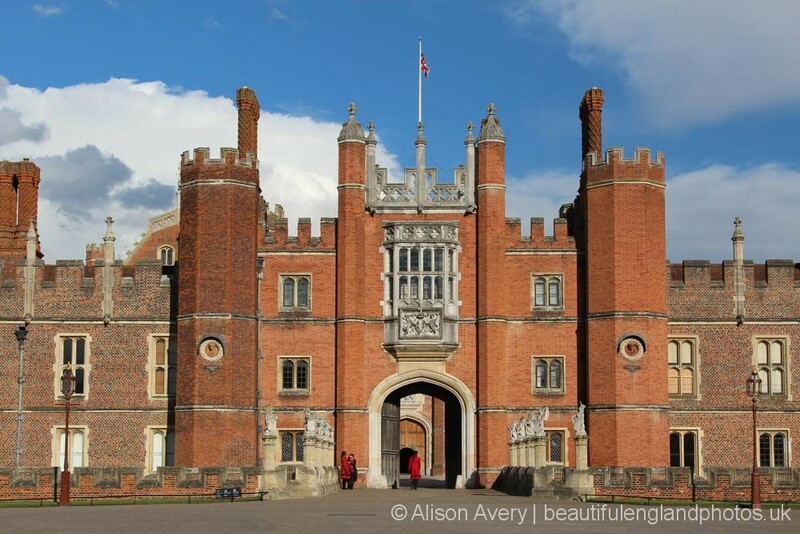 Hampton Court Palace, in people’s imagination, is dominated by Henry VIII. All of his six wives lived here at various times. When he died in 1547, he had divorced two of them and beheaded two. Jane Seymour, who gave him his beloved son, died shortly after giving birth. Henry was buried beside her in St George’s Chapel, Windsor. Catherine Parr survived him. Hampton Court was not just a home to Henry, but also a place to have lavish banquets and enjoy extravagant court life. Today, we might describe it as a pleasure palace. 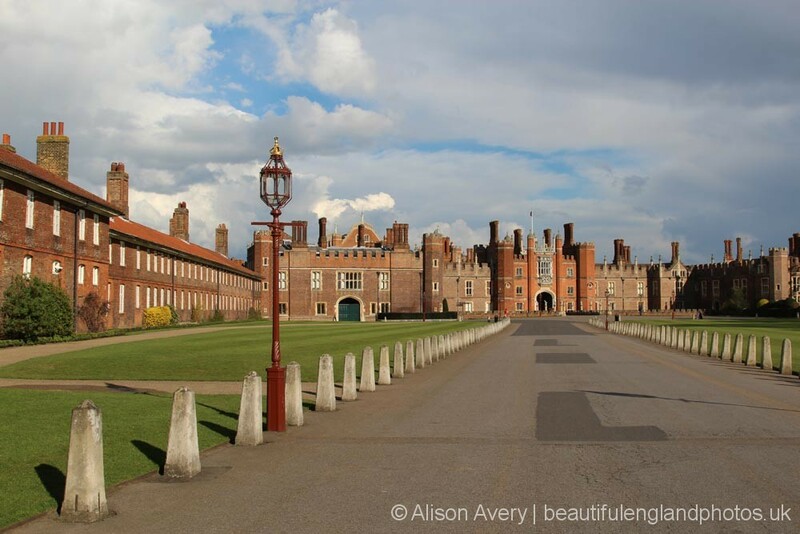 Hundreds of years later, Henry would no doubt have approved of the various events that take place today in the grand and spectacular surroundings of Hampton Court Palace and gardens. There is an annual music festival in June each year, when world renowned entertainers perform at the Palace in Base Court, one of the Tudor courtyards. In 2018, there will be outdoor performances over thirteen days, between 5th and 23rd June, by Lionel Richie, Paloma Faith, Jools Holland, The Beach Boys, Tom Jones, Joe Bonamassa and Gary Barlow. George Benson, Katherine Jenkins, Alfie Boe, Jamie Cullum, Sir Cliff Richard, Liza Minnelli, Burt Bacharach, Frankie Valli and The Four Seasons, Sir Elton John, Eric Clapton, Dionne Warwick, Andrea Bocelli, Darcey Bussell, Jose Carreras, Russell Watson, Joaquin Cortes, Bryan Adams, Katie Melua, James Morrison, Lisa Stansfield, Ringo Starr, Westlife, Bryn Terfel and Rufus Wainwright. But is the garden a wilderness? Every year since 1993, the Royal Horticultural Society have held an annual flower show in the grounds of the Palace. It is now the world’s largest annual flower show, spread over 34 acres on both sides of the Long Water. 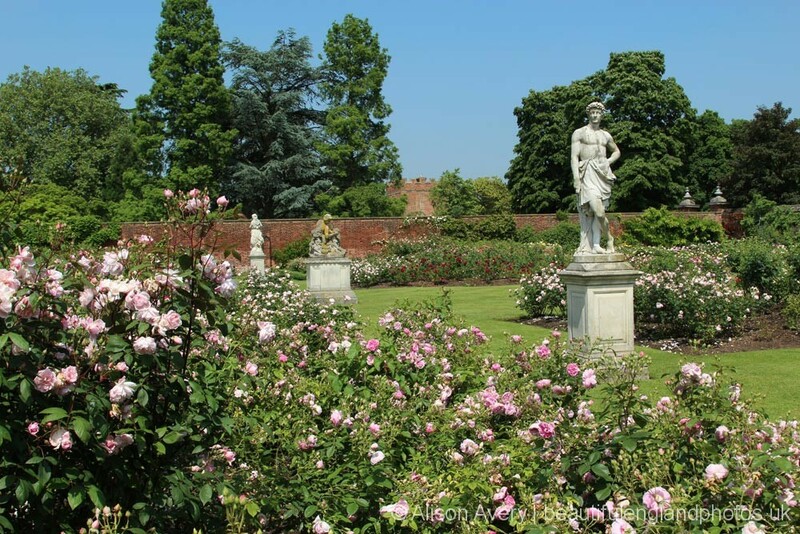 Over 140,000 people attend this week long event in early July, AND “yes”, the gardens at Hampton Court are a “wilderness”! Technically, the wilderness is a formal garden design, a place to wander, rather than an uncultivated area of land. 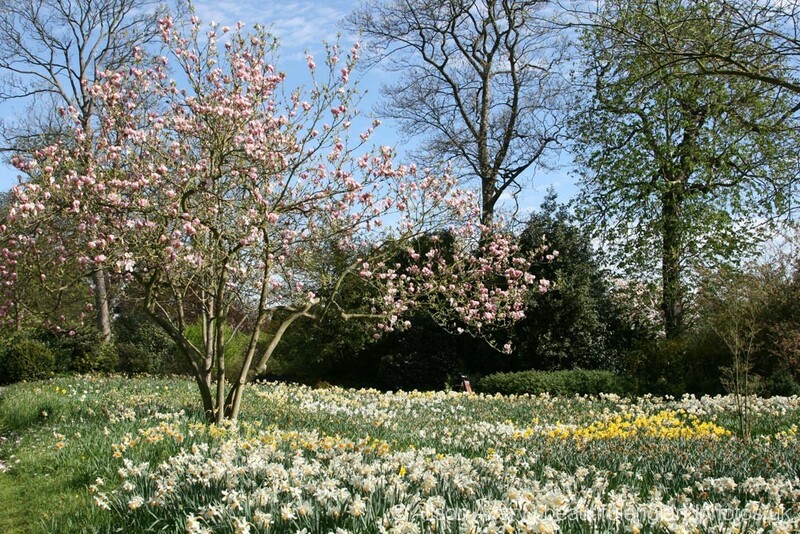 In fact, in the Wilderness at Hampton Court, thousands of spring daffodil and crocus bulbs have been planted. Come and be amazed, or you can just get lost! The Maze in the garden has been confusing and intriguing visitors for over 300 years, with its many twists, turns and dead ends. Over 330,000 visitors enter every year. It was commissioned by King William III about 1700 and planted with high hornbeam hedges, but today it consists of yew hedges. The aim is to reach the centre and then escape as soon as possible without getting lost. Hedge mazes were popular in the 18th century. The seclusion provided, made it an ideal private place for members of the royal court to meet and entertain lady friends. Henry VIII, enjoyed taking part in tournaments and other sports. From the five brick towers in The Tiltyard, Henry and his courtiers would have watched jousting and wrestling. Only one tower remains today, where the popular Tiltyard Cafe is situated. The Royal Tennis Court at Hampton Court, was probably built by 1529. The game of real tennis, still played here, is not to be confused with the better known and quite different lawn tennis played at Wimbledon. The Royal Tennis Court at Hampton Court is the oldest place in the world where a ball game is still played. There are less than fifty real tennis courts in the world. It is believed that Henry VIII was playing tennis here in 1536, when he heard that his second wife, Anne Boleyn, had been beheaded on his command, for alleged adultery and treason. The current court was built for Charles I in 1625. Three of the walls used today are 17th century, whilst the other is the original that Henry VIII played on. Each winter, a temporary outdoor ice rink is constructed in front of the Palace entrance for the Christmas Season. The Palace provides a picturesque backdrop to the 1,040 square metre skating rink. On 1st August 2012, Bradley Wiggins earned a gold medal when he won the 2012 London Olympics Road Cycling Time Trial Event, which began and finished at Hampton Court Palace. 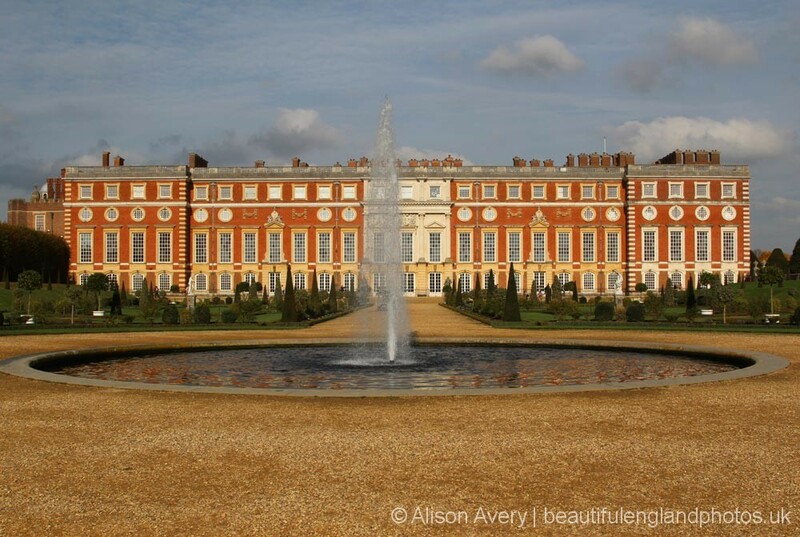 Where in England is Hampton Court Palace, Surrey?